I know from both my god daughters and Ed’s nephew and niece that small children can be both demanding and exacting when it come to cakes. For his 6th birthday F was insistent he had wolf cakes, two years before he had insisted on an Easy Jet cake. My good friend Sarah did not get off that lightly when Ted asked for a Google cake for his last birthday. 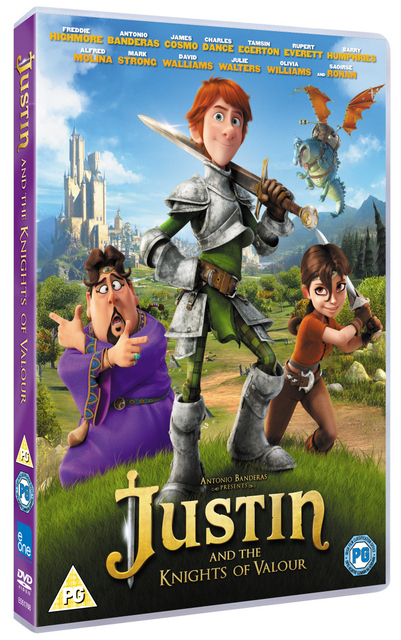 To celebrate the release of Justin & the Knights of Valour which is out on DVD/Blu-ray from 3rd February, I was asked to come up with some ideas for a castle cake or knightly food. 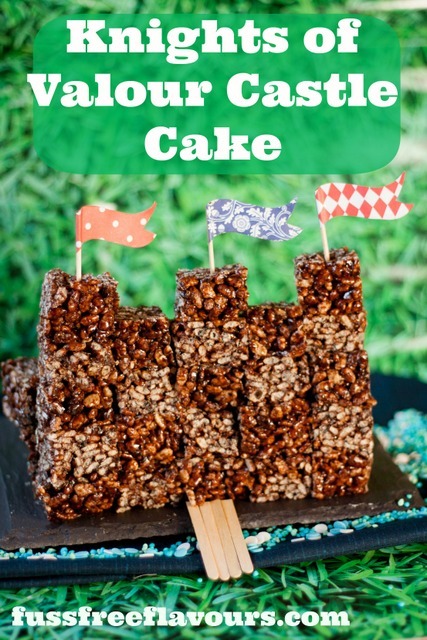 In support of all of those who need to make cakes for demanding exacting children everywhere, I came up with this very very simple, but effective no bake castle cake. Anyone can make this cake and even young children will be able to help assemble it. The cake also does not need cutting and easily breaks down into bite sized pieces, perfect for little hands and tums. Given its “blocky” construction I think it would double up as a rather effective Minecraft themed cake. To minimise waste you need to use a straight sided baking tray to mould the crispie mix. You can get creative with sticking sprinkles to the cake, or leave it as it is. To make it more fun add a few Lego or Playmobile figures to guard the castle. By substituting a non diary spread this cake is easily adapted to be vegan – egg free, dairy free and with the GF rice crispies can also be gluten free. Please double check all ingredients on the packaging if catering for anyone with allergies and take care to prevent cross contamination. 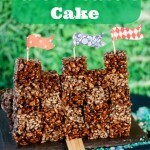 If you try this How To Make a Simple & Easy Minecraft Castle Cake please tag #FussFreeFlavours on Instagram or Twitter. It is amazing for me when for me when you make one of my recipes and I really do love to see them. You can also share it on my Facebook page. Please pin this recipe to Pinterest too! Thanks for reading Fuss Free Flavours!